Signs of Spring 12: Tree Frogs! About three weeks ago it had finally gotten warm enough in the evening for Deborah and I to sit out on our deck. This is a great time of year to sit outside in the developing darkness: there are no swarms of summertime mosquitoes yet, and the evening is full of great sounds. The robins are singing their nightly roosting songs, and the cardinals and the wrens are singing their territory songs. Also the leaves on the trees that encircle the deck are getting large enough that they have begun to seal off and hide our sitting space. Sitting very still we feel like we have become part of action around us! Another song popped up into the night time concert a couple of weeks ago. It was a chirping, whirling song from many, widely scattered voices. The song started as the daylight began to fade and kept up all through the night. Every year the same thought process crawls through my conscious brain when I hear this song: what kind of bird is that? That’s not a bird! Is that a raccoon? What IS that? Oh, yeah …. Tree frogs! 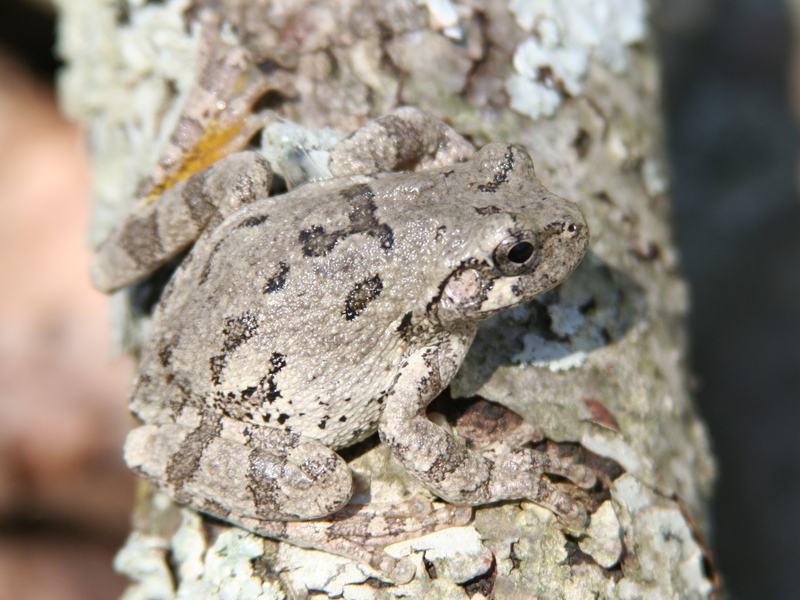 The gray tree frog (Hyla versiciolor) (pictured above) is a close relative of the spring peeper (Hyla crucifer (which is now more properly called “Pseudacris crucifer”)). We heard the choruses of the spring peepers back in March. The gray tree frogs emerge from their hibernation sites down in the leaf litter and wet, woody debris of their forest habitats later in the spring than the peepers and use their larger body size (they are 1.5 to 2 inches long compared to just an inch for the peeper) to generate a louder, deeper, more resonant song. As in the peepers the male tree frogs are the ones doing the singing. The male tree frogs, though, are primarily solitary (as compared to communally chorusing peepers) so their songs are not as organized or as synchronized as the peepers’ “compositions.” Like the peepers, the tree frogs are trying to impress and attract their females to meet them in their surrounding ponds and puddles of water in order to mate. Their singing can go on for weeks or sometimes even a month or more! 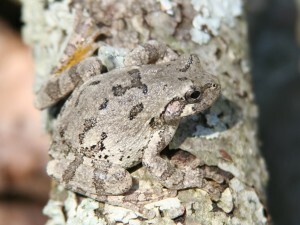 The gray tree frog is found throughout the eastern United States. It lives in trees and shrubs around ponds or seasonal wetlands. Although they are called “gray” they actually can have a range of colors from almost black to a very light green or even white. They can also change their skin color to match their surrounding substrates. These frogs are very good at camouflage (and are, subsequently, very difficult to find!). Their skin has more warts than a typical frog (but less than a typical toad!). They also have yellow patches on the inside of their back legs which are visible when they jump. The males have dark colored throats, and the females have white colored throats. If a male successfully draws a female into his mating area, the smaller male will cling to the back of the female (an arrangement called “amplexus”) and wait for her to release her eggs into the water of the pond or puddle. He then releases his sperm and fertilizes the eggs. Small clusters of the fertilized eggs stick to the water plants and hatch into tadpoles after three to seven days. After six to eight weeks of aquatic life, the tadpoles metamorphose into froglets that hop up into the surrounding vegetation in search of very small insects. The rapid, early life development of this species probably reflects the transient nature of its mating habitat’s water sources! There is a distinct rush to get onto land as quickly as possible! The gray tree frog has mucous secreting pads on its toes. These sticky toe pads enable it to cling tightly to tree bark and climb easily through its arboreal habitat. It is a voracious, nocturnal predator of insects and can sometimes even be found outside a lit window of house (sometimes even sticking onto the window!) feasting on the flying insects that are attracted to the light. The evening chorus of the gray tree frogs is still going on around my house although its intensity is waning. The small creek down in my lower woods is keeping the spring pools around it full enough to support the tadpoles. We need a few good spring rains to keep the creek flowing for the next six to eight weeks, though. It is transitioning into summer all around us! The adult titmice and house finches are feeding their demanding fledges at our feeders. The cardinals and chickadees will soon join them in a frantic rush to get brood number one weaned and fledged so that brood number two can be started. The June bugs are even buzzing at the screens on our porch! (a much nicer sound than stink bugs buzzing inside the house!). I even have a yard full of small rabbits (this year’s early brood?) who look like they are thinking about reproducing! The air is getting warmer and more and more humid and everything is green and growing! One Response to Signs of Spring 12: Tree Frogs!